Today’s sermon was really, really good. Our pastor is doing a series called “The Fight” – about time management in our busy schedules of today. 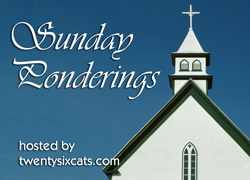 Today’s sermon audio isn’t on the website yet, but when it is available you can listen to it here. For now, I’ll try to summarize the message from my notes. – Ask yourselves: Is my focus too much on what I have? Buy things for their usefulness, never for their status. Don’t buy anything when you feel you have to have it but don’t necessarily need it. Don’t buy anything in the face of an emotional appeal. Don’t buy anything that produces or leads to an addiction in you. Resist buying anything that will distract you from your primary goals or objectives in life. Develop the habit of giving things away. I thought this message was thought-provoking and challenging. Number 5 of the above list is especially applicable to me! Our pastor encouraged us to pray that God would give us a desire to seek Him and simplify our lives.